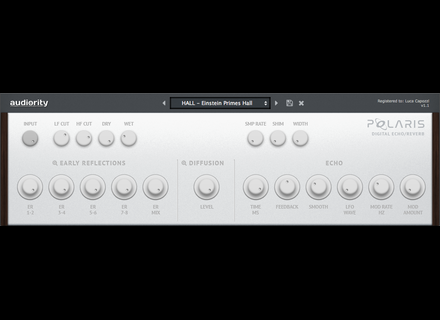 Polaris, Software algorithmic reverb from Audiority. Audiority's Polaris echo/reverb plugin has been updated to v1.4, featuring an improved interface and better performance. The new version is available through downloading and installing the demo from the product page. An experimental version compatible with Windows XP SP3 is also available. More details at Audiority's website. Rhythmic Robot presents Soviet Organ Rhythmic Robot has released Soviet Organ, a new Kontakt library sampled from a vintage Soviet Russian organ. Video review of Audified MixChecker The MixChecker plug-in from Audified makes it possible to reference your mix on a wide range of simulated speaker types. VIProducer releases Just The Bundle Volume 1 VIProducer releases Just The Bundle Volume 1, a bundle developed with DJ/Producer Joachim Garraud.